The Gaillardia plants offered for sale are mostly Gaillardia x grandiflora, a very colourful group of hybrids and a very hardy plant. A few species are also offered by specialist nurseries, all requiring similar growing conditions. 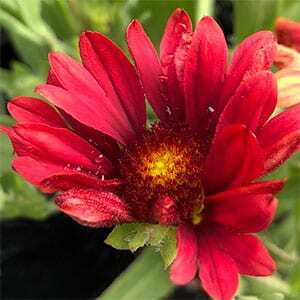 Grown for the long lasting and colourful flowers, Gaillardia are native to both North and South America. Commonly known as the ‘Blanket Flower’ they do indeed look like a colorful blanket when in full flower. Thriving in fairly dry conditions they are treated as a short lived perennial, however this will depend on climate as well as cultivar. From the Asteracae family they have daisy like flowers, and some gardeners regard them as some of the best of the family. Gaillardia plants include species such as G. pulchella, grandiflora and aristata. All are a drought tolerant plant from the sunflower family (Asteraceae), native to North America. They can easily be grown from seed however improved cultivars are readily available from online mail order suppliers. Gaillardia is often referred to as blanket flower. Regarded as drought tolerant and has bright coloured daisy like flowers in summer through to autumn. Gaillardia is fast growing and can be deadheaded to prolong the flowering season. Containers – Yes, Gaillardia grow well in containers. Height – Generally 70 cm to 1m in height, mostly on the smaller side. Spread – Clump forming to 1m often less. Flowers – A range of flower colours in the yellow to orange and red tones. Pruning – Deadhead after flowering to promote a second flush of flowers.